Here are a few of the Asian specialty foods that you can enjoy at Kopi Café. Come back often! $8.80 Lunch Special - Meal & Drink! (see details)! AND Nasi Lemak Fish Curry! 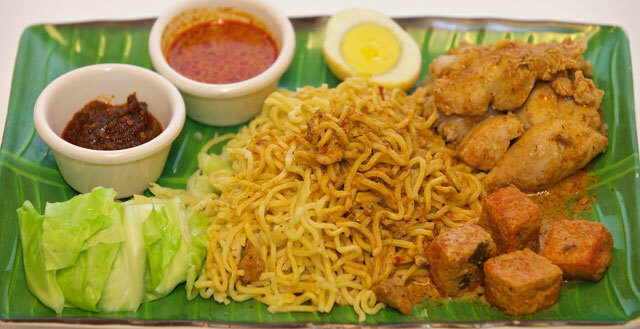 Laksa Chicken is a delicious bowl of noodles in a unique spicy soup base which blends Chinese and Malay cooking styles. The key ingredient giving Laksa its unique flavor and aroma is the Laksa leaf or the pepper plant. A spicy paste made of lemon grass and prawn paste (locally known as belachan) gives it a great spicy taste! Authentic Laksa uses only white vermicelli noodles with fish cake, tofu and vegetables added. Laksa Seafood is spicy curry rice noodles with tofu, fish cake, boiled eggs and bean sprouts added - plus fish balls, fish meat, shrimp added! Laksa Vegetarian is spicy curry rice noodles with tofu, fish cake, boiled eggs and bean sprouts added - with a vegetarian curry soup base! 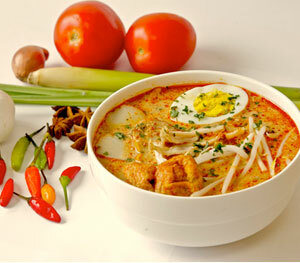 Laksa is a delicious bowl of noodles in a unique spicy soup base which blends Chinese and Malay cooking styles. The key ingredient giving Laksa its unique flavor and aroma is the Laksa leaf or the pepper plant. A spicy paste made of lemon grass and prawn paste (locally known as belachan) gives it a great spicy taste! 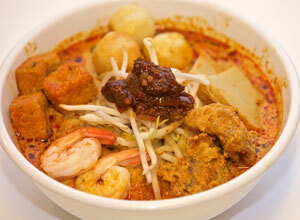 Authentic Laksa uses only white vermicelli noodles with fish cake, tofu and vegetables added. 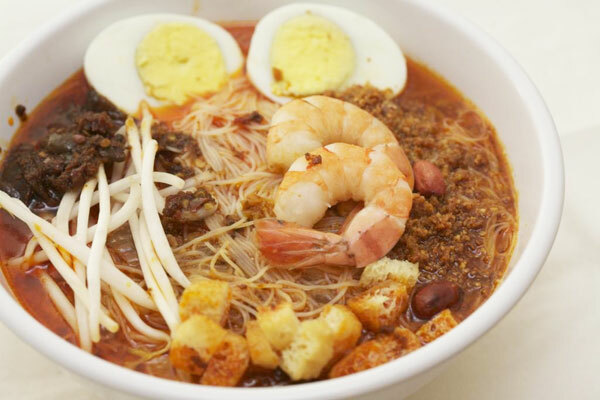 Origins and Traditions - Laksa in Indonesian means sepuluh ribuor "10 thousand" a reference to the many strands of the fine white vermicelli noodles in the dish. Some believe the name to be of Sanskrit origin, with a particular link to Indonesia and possible roots in the ancient Majapahit era. Others however, believe it to be of Chinese origin, having been brought in by immigrants and adapted to local tastebuds. 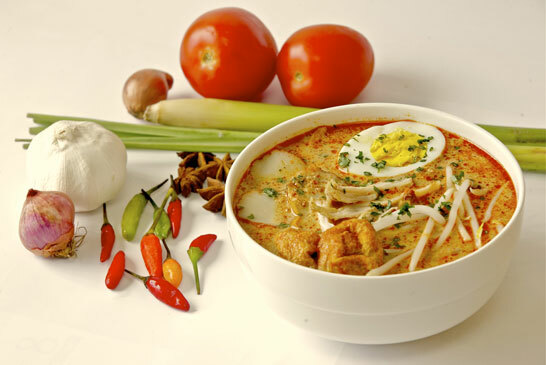 Laksa has become so popular in Southeast Asia that many variations of the traditional dish has been created such as; Singaporean Laksa, Penang Laksa, KL Curry Mee, Sarawak Sambal Laksa, Johor Laksa, Perak Curry Mee, etc. Variations ?There are many variations of Laksa, but only 2 distinct types: Laksa Lemak, Malay for the rich flavor derived from coconut milk. Assam Laksa, a clear, thin sweet-and-sour soup-base has a clear Thai influence. 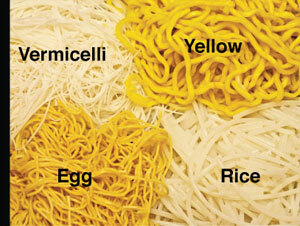 Choose from one of four noodle options for your Laksa! Mee Siam – "Shrimp Spiced Vermicelli"
Mee Siam ( ) which means "Siamese noodle." A popular Singapore/Malaysian Vermicelli rice noodle dish in spicy, sweet and sour gravy. In Singapore and Malaysia, it is a pure Nyonya speciality served with salted soy beans, dried bean curd, boiled egg, and tamarind, garnished with spring onions and Chinese chives. There are some slight variations in ingredients. 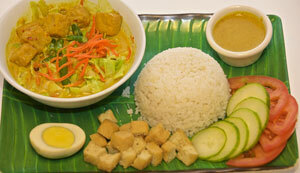 This dish is also very popular in Thailand and other Southeast Asian countries. 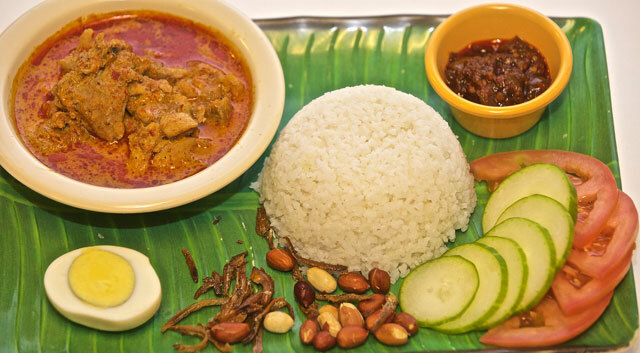 Nasi Lemak Chicken Curry is a fragrant coconut rice dish topped with a sweet Sambal chili (shrimp based) sauce; accompanied by sliced cucumbers & tomatoes, boiled egg, salt-free fried peanuts & pan-fried anchovies. Chicken Curry in this one! 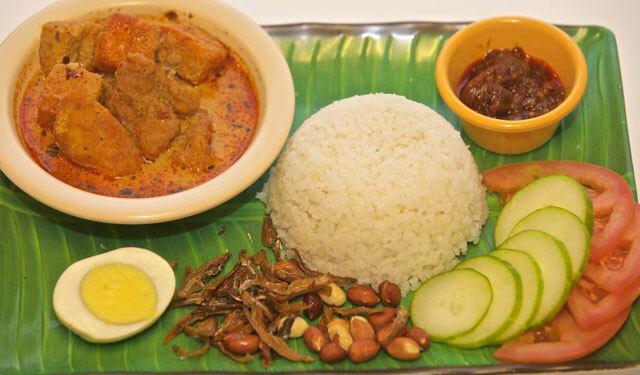 Nasi Lemak Fish Curry is a fragrant coconut rice dish topped with a sweet Sambal chili (shrimp based) sauce; accompanied by sliced cucumbers & tomatoes, boiled egg, salt-free fried peanuts & pan-fried anchovies. Fish Curry in this one! Nasi Lemak Vegetarian is a fragrant coconut rice dish topped with a home-made vegetarian curry base; cooked with tofu, tomatoes, green beans, bean sprouts and cabbage. Nasi Lemak is a fragrant coconut rice dish topped with a sweet Sambal chili sauce; accompanied by sliced cucumbers & tomatoes, boiled egg, crispy fried peanuts & anchovies. Modern-day variations on the dish now offer an extensive array of other side dishes. Origins and Traditions - Nasi Lemak is Malay for "rice in cream", a reference to the rice being cooked in coconut milk, or "richly flavored rice". The origin dates back to 1935. 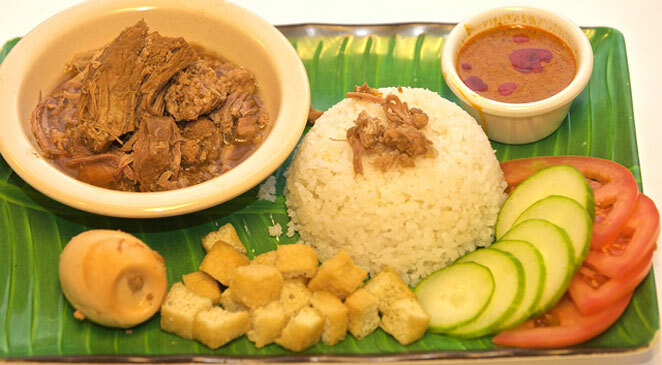 Early Singapore Malay communities residing by the seafront created this innovative dish due to the availability of ingredients such as the coconut. Side dishes added to the rice came from the village’s natural resources ?vegetables plucked from the garden and anchovies harvested from the sea. Today it is a popular dish eaten in Singapore not only at breakfast but also throughout the day. Variations ?Since the 1980s, the dish has gradually evolved to include a greater variety of accompaniments besides the standard anchovies, chili sauce and cucumber. Our awesome House Special Sambal Chili Sauce makes this a best seller! 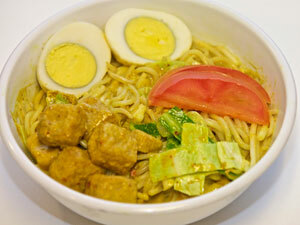 Curry Noodle Chicken Fresh, yellow noodles served with home made Curry Chicken, tofu, cabbage, boiled egg. Sambal chili and Curry sauce on the side. Fresh, yellow noodles served with home made Curry Chicken, tofu, cabbage, boiled egg. Sambal chili and Curry sauce on the side. 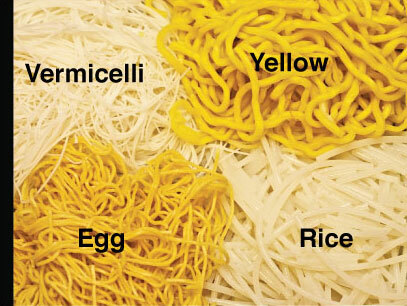 Stew Pork Rice/Egg Noodle An MSG free, traditional Chinese cooking style with a fine selection of lean & minced pork. Serve with rice or egg noodles; added with stew egg, sliced tomatoes & cucumbers, tofu and Chicken Curry sauce. An MSG free, traditional Chinese cooking style with a fine selection of lean & minced pork. Serve with rice or egg noodles; added with stew egg, sliced tomatoes & cucumbers, tofu and Chicken Curry sauce. 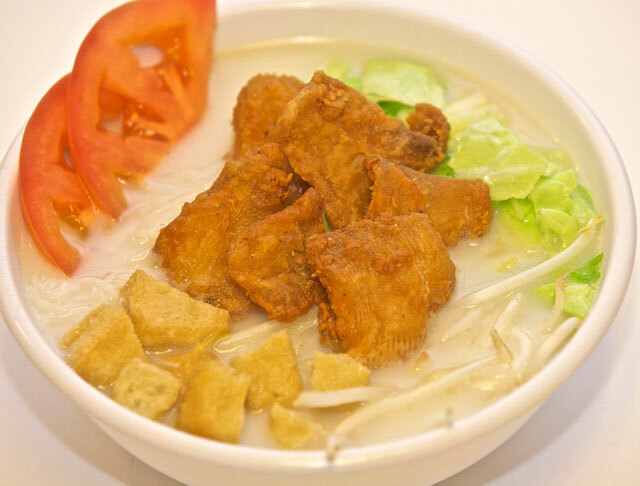 Fish Noodle Soup with Fish Meats Lightly battered fish in a savory noodle soup. Fishball Noodle Soup Fishballs in a savory noodle soup. 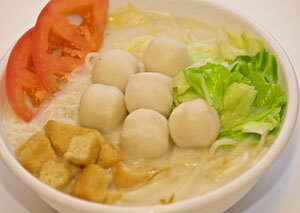 Noodle Soup, choice of Fish Balls or Fish Meats An MSG free, home made clear fish soup served with rice noodles. Fish balls or Fish meats, tofu, fish cake, anchovies, sliced tomatoes and cabbage. Gado Gado Salad An Indonesian salad of boiled vegetables served with a peanut sauce dressing. Gado Gado Salad (Indonesian or Betawi), also known as Lotek (Sundanese and Javanese) is an Indonesian salad of boiled vegetables served with a peanut sauce dressing; Popular across Indonesia and South East Asia. 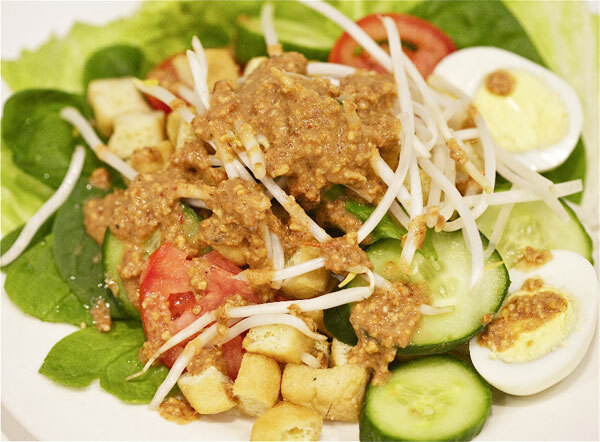 Though it is customarily called a salad, the sauce is a larger component of gado-gado than is usual in Western-style salads. Sambal Chili is a condiment that has a chili-based sauce with Indonesian origins. Our Famous Homemade Sambal Chili. Available in Sweet and Spicy. 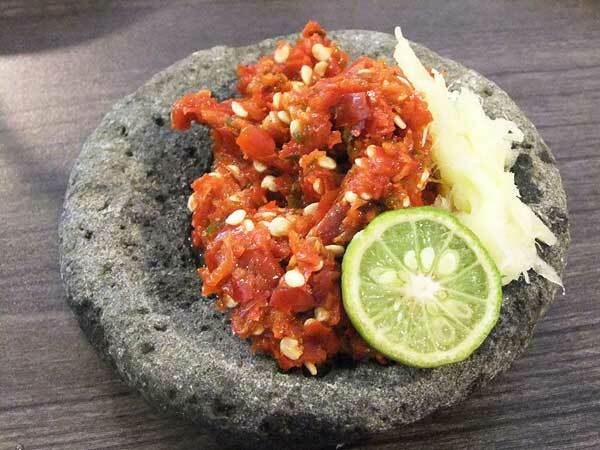 Sambal is a condiment that has a chili-based sauce with Indonesian origins. Sambals are popular in Indonesia, Malaysia, Singapore, the southern Philippines, and Sri Lanka, as well as in the Netherlands and in Suriname, through Javanese influence. Typically made from a variety of chili peppers, it is sometimes a substitute for fresh chilis and can be extremely spicy for the uninitiated. Secondary ingredients of sambals often include shrimp paste and/or fish sauce, garlic, ginger, or shallots / green onions, sugar, lime juice, and rice vinegar or other vinegars.